“If an egg is broken by an outside force, life ends. 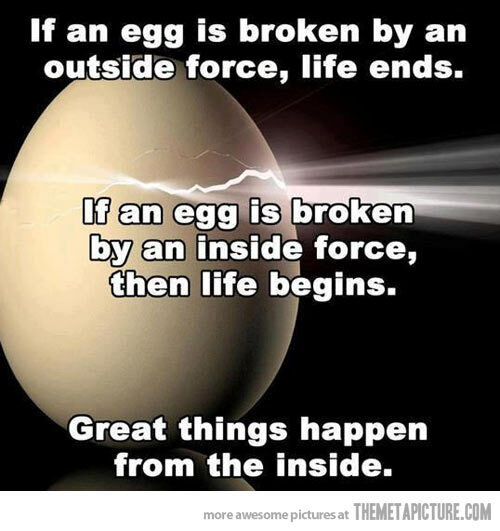 Great things happen from the inside”. I have another egg analogy for you. Place a potato (which is hard) in hot water and in time it will turn to mush. Place an egg (which is soft) in hot water and it will become stronger. Place tea in hot water and it will transform the water. Thanks Elizabeth! You are on a egg roll! Good one! Here’s to working from the inside out. And thanks to elizabeth and diana too! Clever message. I will not let the simplicity fool me. Breaking from the inside is not for the fainthearted…………..but it is absolutely essential for those who want to fluff out their feathers and live a life of purpose. Oh wow! Love this. and all the comments too! Thanks Louise – and to your fellow comment musketeers! So glad your enjoyed this at eggsactly the right time!